NOTABLE ALUMS – Donald Trump, Elon Musk, Warren Buffett, Rod Rosenstein and Ezra Pound – what else is there to say? Harvard College students describe the school as a “dynamic universe” and an “amazing irresistible hell” that pushes them to the extremes of their intellect and ability. Unsurprisingly, the legendarily “very difficult” school attracts some of the country’s most promising youth, who rise to the occasion in almost every aspect of their life on campus, not just the classroom. Harvard’s recent financial aid enhancements have increased the number of applications by a landslide, but even after getting past the admissions hurdle, “people find ways to make everything (especially clubs and even partying) competitive.” Happily, this streak is more of a “latent competition,” as there are more than enough opportunity and resources to go around. “It is impossible to ‘get the most out of Harvard’ because Harvard offers so much,” says one student. Much like the students, the professors at this “beautiful, fun, historic, and academically alive place” in Cambridge, Massachusetts, are among “the brightest minds in the world,” and “the level of achievement is unbelievable.” Some of the larger introductory classes are taught by teaching fellows (TFs), meaning “you do have to go to office hours to get to know your big lecture class professors on a personal level,” but once your figurative underclass dues are paid, the access to “incredible” and “every so often, fantastic” professors is perfectly within reach. Top it off with Grade-A internship and employment opportunities, a good old alumni network, and a crimson pedigree for your résumé, and you may just end up agreeing with the Harvard student who refers to his experience as “rewarding beyond anything else I’ve ever done.” Though the administration can be “waaaaay out of touch with students” and “reticent to change,” it at least “does a good job of watching over its freshmen through extensive advising programs,” and students all have faith that their best interests are being kept in mind. Director of Track and Field, Jason Saretsky was in my first recruiting class ever at Columbia University running 1:51 for the 800m and 2:26 for the 1000m. John Minicus, Hingham, MA - Javelin - 195'3", Long Jump - 22'10.25", Triple Jump 45'5.75"
Sam Welsh, Lunenburg, MA - Discus (1.6k)- 212' 0", (2 k)-184' 4", Shot put (12lb) 59' 1"
Blake Young, Fayetteville, Arkansas - Discus - 166' 11", Shot Put - 56' 1.75"
Obie Amudo, The Woodlands, TX - Triple Jump - 38'5.5"
DaLoria Boone, Milledgeville, GA - 100m – 11.60, 200m – 23.83w, Long Jump – 20'4"
Kelisa Cain, Mechanicsville, MD - 100m – 11.49w/11.61, 200m – 24.16, LJ – 18' 0.75"
Alana Carroll, Averill Park, NY - PV- 13'6.25"
Fredericka Lucas, Richmond, VA - 100m - 12.52, 200m - 25.54, High Jump – 5' 2"
Chelsea Offiaeli, South Windsor, CT - Shot Put – 44' 3.75"
Grace Yeboah-Kodie, Woodbridge, VA - Long Jump - 18'0", Triple Jump - 40'4"
How Fast Does My Son/Daughter Need To Run To Get Into An Ivy? Cornell is "more than a bunch of books and exams—it's an experience that challenges students to break free from their comfort zones." Seven different undergraduate colleges "really make it feel small and specialized," with "top-notch faculty." The university is "a place where any person can find instruction in any study (and it won't feel like work)," as it allows its students to explore any kind of interest they may have (ranging from Punk Rock as a literary genre to particle physics) while "also offering an incredible amount of depth within each department." There are endless opportunities to "pursue other topics, enhance your knowledge of things that you're already interested in, and try completely random things that you'd never even heard of before." Professors are "experts in their field, almost always conducting their own research, and are enthusiastic about passing their knowledge on to their students." "Cornell keeps the faculty, research, and access to the most recent information so up-to-date that this campus is as connected as any place in the world." Between balancing those amazing resources and the community feel, the Cornell bigwigs get a lot of applause, as they have "proven time and time again that they care, both on an individual and system-wide level." Great internships, a strong alumni network, and "boundless opportunities after graduation" round out the "definition of amazing" that is Cornell University. Cornell Track and Field purposefully does not set recruiting standards. Why? They would rather sift through a large volume of prospective student-athletes expressing interest in their program and school and work through them prospect by prospect just in case there are “diamonds in the rough” out there. Very cool. Although Bill Nye The Science Guy did go to Cornell – he did not run track. However, ESPN’s Sarah Spain did run for the Big Red. Spain was a heptathlete and was co-captain her senior year. Alagor was the New York State champion in the shot put in 2018 as well as the PSAL City Champion in the indoor weight throw, indoor shot put, and outdoor shot put. Her personal bests are 41-1 1/2 in the shot put, 123-9 in the discus and 48-3 in the weight throw. A standout in the high jump, Anderson has repeatedly jumped a personal best of 5-7. As the third-best high jumper in Connecticut, she helped her team to several championship seasons as well as posting a strong individual presence at New Balance Nationals. A several-time All-Long Island Track and Field Team athlete, Arroyo has long jumped as far as 18'8.5" for a school record-breaking mark. To further show of her athleticism, she has been a strong contributor on sprint relay teams as well as being a multi-sport athlete by playing volleyball for Smithtown West HS. An outstanding sprinter, Burdette had a fantastic senior season. She led her team to the KingCo championship winning three events (200, 400, 4X400). At the 4A state meet, she anchored her team to a 4X400 win, splitting 55.94 and finishing second at 400 meters in a personal best 56.15. Her Issaquah HS team finished second at the championship. Farquharson is an incredible triple jumper with her most impressive jump as far as 40-4 1/2. Her final high school season ended with an outstanding victory in the triple jump at the Carifta Games. In addition, she has long jumped 18-4 1/2 and high jumped 5-5. Furth had an amazing senior season at Newton HS, winning both the state section and Group 2 400 meters, recording a best of 55.89. She finished fifth at the Meet of Champs for Newton HS and is an accomplished relay runner. One of the top middle distance runners in New York state, Gaedje has split 2:09 for 800 meters and has an open best of 2:12.81. She also has run 57.95 for 400 meters. A former Texas HS state runner-up in the hurdles, Garza spent her senior year at IMG Academy. There, she had an outstanding season running personal bests and setting school records at 60 hurdles (8.90), 100 hurdles (13.97) and 300 hurdles (43.57). Green had a terrific senior year at Oakton HS, improving across the board and concluding her career with a fourth-place finish at the Virginia state meet in the 1600 and with personal bests of 2:16.04 for 800 and 5:01.28 for 1600. A top distance talent from New Jersey, Hans has a PR of 11:08.55 for 3200 meters and was one of her area's best in cross country. Hasser had big breakthroughs as a senior at Homestead HS, improving to 4:59.21 for 1600 and 10:48.35 for 3200. She also advanced to the highly competitive California state cross country meet. A talented multi-event athlete, Higgins finished fifth at the Pennsylvania State Championships in the javelin and seventh at the PTFCA Indoor State Championships in the 400m with a PR time of 57.83. Higgins boasts personal bests of 137-1 in the javelin, 17-7 in the long jump, 5-2 in the high jump and 2:15.74 in the 800m. One of the top middle distance runners to come out of Deerfield and a relative newcomer to full-time running, Hudson has personal bests of 4:41 for 1500 meters and 10:24 for 3000 meters. One of New York's best in the 2K steeplechase with a PR of 7:12.35, Hurt has great range, boasting a best of 2:15 for 800 meters while also qualifying for the state meet in cross country. A true multi-event athlete, Juskeviciute won the heptathlon at The New Balance National High School Championships by a margin of more than 200 points. She posted a personal best in the event with 5,251 points. As a true multi-event athlete, she has shown impressive marks in the sprints, jumps, throws and middle distance events. Kuramoto will be a pole vault specialist for the Big Red with a high school personal best of 12-9. She placed as high as third at the New York State championships. She was also a multi-sport athlete in high school as a soccer player. Law emerged as one of the most versatile middle distance/distance runners in New York state, with personal bests of 2:14.00 for 800 meters, 4:38.59 for 1500 meters, and 9:55.73 for 3000 meters. The Section 8 champion at 3000 meters and county champion at 1500 meters, Law was 12th at the NY state cross country meet. Twice the bronze medalist at the Washington state cross country meet, Meyers was also a force across the board on track with personal bests of 2:15.04 for 800 meters, 5:01.70 for 1600 meters, and 11:04.53 for 3200 meters. The Virginia 4A state champion in cross country and in the 3200 meters on the track, Morris was one of the top runners in the Southeast, claiming a top-10 finish at the Nike Southeast Regional cross country championships. She has PRs of 5:01.99 for 1600 meters and 10:53.84 for 3200 meters. With personal bests of 5:02.66 for 1600 meters and 10:57.66 for 3200 meters, Olson has been among the best in New Jersey on the track for several years and was the sectional runner-up in cross country as a senior. Overholt won multiple Ontario championships representing London Legion and was a double scorer in the Canadian Juniors at 100 and 400 hurdles. She enters Cornell with bests of 8.81 (60 hurdles), 13.77 (100 hurdles), 61.38 (400 hurdles) and 56.13 (400). A hammer specialist with a personal best of 167-5, Polando was runner-up at the Rhode Island Class A Championships and finished sixth at the New Balance National Championships. She comes to Cornell ranked sixth in the country among hammer throwers in her class. A transfer from Ohio State who competed for Cornell last spring, Sam has already made a big mark on the Big Red's relay teams. She had an outstanding career at Blake HS running 11.79 – 100 meters, 24.35 – 200 meters and 54.14 for 400 meters. At Ohio State, she recorded at PR 24.14 and finished 10th at the Big Ten Conference running 54.44 at 400 meters. Siciliano has fought relentlessly to claim a top spot on the Indiana pole vault leaderboards, finishing third in the state meet as a senior. She has continually progressed throughout her high school career, wrapping up with a personal best vault of 12 feet. A transfer from American, Stratton ran 5:10.38 for 1600 meters and 10:59.58 for 3200 meters as one of the top preps in Florida. While at American, she earned a top-20 finish at the Patriot League cross country championships and has a 6K cross country PR of 21:45. One of the top middle distance runners in New England, Zitzmann was the Rhode Island state runner-up in the 1500 meters and placed fourth in the 800. She's run 2:17.70 for 800 and 4:40.31 for 1500 meters. Each year, Ivy League coaches use approximately 250 admission's spots on track and field/cross country recruits. Typically the divide between men's and women's programs is fairly equitable, leaving approximately 125 spots for each gender. Below you will find the minimum performance standards to will have to achieve to be recruited by an Ivy League program. LJ: 22 ' 6" / 18' 6"
HJ: 6' 7" / 5' 6"
Tucked away in bucolic New Hampshire, Dartmouth College manages to strike a nice "balance between the intimacy of a college [and] the opportunity of a university." Students feel fortunate that the administration places an "emphasis on pursuing passions, and making the college experience your own." And while Dartmouth certainly maintains a "competitive" atmosphere, students here truly appreciate that "no one really talks about their grades openly." Indeed, it's "generally understood that everyone is smart." A neuroscience major tells us that academically, "Dartmouth puts a huge focus on the undergraduate students, and I have found my professors to be available and engaging in nearly every instance. My classes are all challenging, but they are very discussion based and tend to be small, which keeps me working hard and interested in the material." And an impressed Middle Eastern studies major interjects, "I came to Dartmouth for the professors, but they were far beyond anything I could have hoped for. Not only are they great lecturers and accomplished scholars, they go out of their way to be available outside of the classroom, and to forge relationships beyond what is expected or necessary." When it comes down to it, "Dartmouth is considered to be a combination of Hogwarts and Disney World because it is known for its community and intelligent students and faculty, who also are personable and know how to have fun." Abbey D'Agostino is the most decorated Ivy League athlete in track and field and cross country history. She won a total of seven NCAA titles (1 – cross country; 4 – indoor track; 2 – outdoor track) in her career. In 2014, she became a professional runner for New Balance. Urban legend has Abbey’s HS PR’s somewhere around 7:00 for the Mile! LJ 22 ' 6" 18' 6"
HJ 6' 7" 5' 6"
Columbia University, the Ivy League's New York City office, has been around for more than 250 years, providing prestige, rigorous academics, a strong alumni network, and a multitude of opportunities to its students. As intimate spaces carved out of the larger university, Columbia College and The Fu Foundation School of Engineering and Applied Science throw a "vast amount of resources" at its students, with benefits that "extend from clubs to study abroad programs [to]…proximity to one of the greatest cities in the world." Columbia is "all about building intelligent [and] confident students who are ready for the workplace," and there are "many opportunities to satiate intellectual curiosity." The school's Core Curriculum ensures students leave with a breadth of knowledge, and "everyone is smart in some way." "Interdisciplinary-focused Brown University in Providence, Rhode Island is dedicated to undergraduate freedom, meaning students must take responsibility for designing their own courses of study via the Open Curriculum. Students sing the praises of the academic flexibility at this Ivy League institution and the accompanying emphasis on social action. "We would not be...strong students and teachers without a proper system in place to encourage that," says one undergrad. Those who roam these hallowed halls are "constantly questioning what could make the world and our school a better place." Every person "has their own interests and pursues it without any push from others," which is why Brown can be a "very intense" place to go to school—not because students are competing academically with each other, but "because there are so many people doing so much and fighting so hard for it." The Ivy League has a page dedicated to the recruiting process for prospective student-athletes interested in attending a member institution. Although the site avoids providing specific admission's related numbers, it does give a phenomenal overview of the recruiting process in general and the specific nuances related to the Ivy League. As you pursue opportunities to study and compete in intercollegiate athletics, please keep in mind the following admissions and financial aid policies common to all Ivy League schools." Each year, Ivy League coaches use approximately 250 admission's spots on track and field/cross country recruits. Typically the divide between men's and women's programs is fairly equitable, leaving approximately 125 spots for each gender. Here is a list of factors to consider if you are hoping to compete and attend an Ivy. Based on my 20 years as the head coach at Columbia University and recent conversations with many current Ivy League coaches, I estimate that approximately 75-80% of recruits apply with early decision. As a result, it is imperative that you get an early start on the recruiting process. Because of recent NCAA contact rule changes, coaches are now able to start calling you on September 1 of your junior year. Therefore, it is imperative that you ensure that you are on coach's radars prior to the start of your junior year. The idea of pursuing an Ivy can be somewhat intimidating due to impossibly low admission acceptance rates and the total cost of education. However, both areas of concern may be surprisingly less of a factor than you initially imagine. It is not impossible to get into an Ivy League school: I cannot tell you how many recruits and future matriculants were told by their high school guidance counselors that they had no chance of being accepted and were discouraged to apply. A great majority of outsiders grossly underestimate the value of athletics in the admission's process. If you are a great athlete, you will be able to overcome many perceived academic deficiencies. There are student-athletes being admitted to Ivy League schools who score in the 1100s on the SAT and 25 on the ACT. Ivy League Schools can be affordable: It is possible that an Ivy can be among your cheaper financial options. When Harvard, Princeton and Yale changed how they calculate their financial aid awards a few years ago, Ivy League schools became very affordable for many prospects. Quite often while I was at Columbia, we would be among the cheaper options for many of our recruits. Most, if not all of the schools have financial aid online calculators that will give you an early indication of the cost of attendance. Do not be discouraged by the initial price tag. Approximately 60-percent of students attending an Ivy League school receive financial aid. On average, those students receive over $45,000 in grant money. Ivy League schools are significantly better athletically than most people realize. In my last season at Columbia, we were ranked sixth in the NCAA national cross country poll. Over the last 10 years, 12 Ivy League student-athletes have become NCAA Division I national champions. Most of the programs post their recruiting standards online. Generally speaking, you are going to have to be very close to me marks listed below to get serious attention from an Ivy League coach. If you are an athlete at or just below the standards listed below, you are going to have to be a very, very strong student. LJ: 22 ' 6" 18' 6"
HJ: 6' 7" 5' 6"
The Ivy League office determines the overall number of admissions spots that may be used by an athletic department. Each individual athletics program may determine how to distribute those spots. As a result, there is a great disparity amongst individual programs. If you are set on applying to an Ivy, do your research to determine how each program uses their slots. 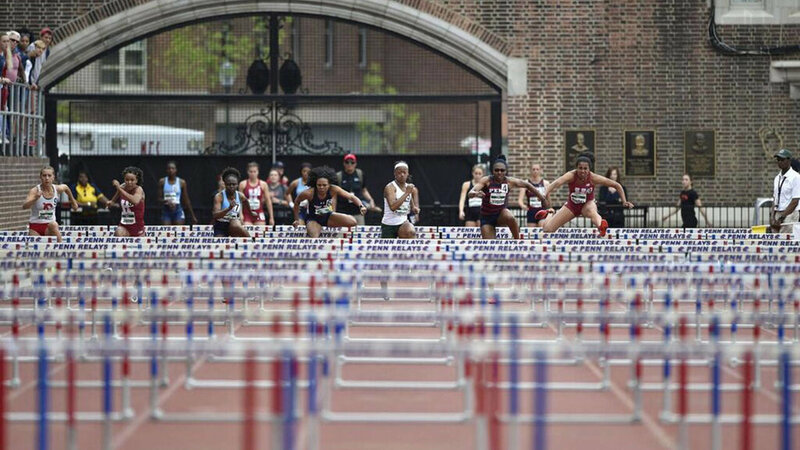 For example, when I was at Columbia our men used primarily all of our admissions spots on the middle distance and distance events while our women distributed our slots between the sprints, jumps, hurdles and distance events fairly evenly. In addition, each program is allotted a different number of recruits and how they are able to support each year. I would suggest looking at past recruit class announcements to get a general idea of how many spots they may have. The Ivy League does not use the NCAA National Letter of Intent program. Instead, they have what is called a 'Likely Letter.' The Likely Letter is the Ivy League's answer to the NLI and brings some certainty to the recruiting process. Likely Letters are provided to recruited student-athletes before official notification from the admissions office arrives. Typically, to receive a Likely Letter you will have to verbally commit to the coach, submit your application for approval from the admissions office and have completed an early financial aid estimate to ensure affordability. The Likely Letter gives you the assurance that the school will grant you acceptance when the letters are sent out. If you find yourself just outside of the Ivy League recruiting standards or did not find a good fit for you and still want to attend a top-tier academic institution, you still have options. I would suggest looking at schools such as The University of Chicago, MIT, John's Hopkins, Washington University, Emory, Tufts, Williams, Swarthmore, Amherst, Middlebury, RPI and NYU. Each of these schools is among the top-ranked academic schools in the country and have had very successful track and field and cross country programs. Typically, their recruiting process mirrors that of the Ivy League. DON'T oversell yourself as a student. It is imperative that you express to the coaches or with whom you are speaking how important the athletic piece is to you. Coaches are going to want to have confidence in your drive and motivation to succeed athletically. Furthermore, never express to a coach how stressed you are because of your high school class load. My initial thought was always, "how will they ever survive the rigors of our academic and athletic demands if high school is overwhelming them." DO stay the course if an Ivy League school is what you want. A coach's priority list will change significantly throughout the course of the fall as recruits start saying no, decide they cannot afford the school or are deemed inadmissible by the admissions office. DON'T get a "C"! Remember, your admission's process will differ slightly from that of a non-supported applicant. As an athlete, they will look for reasons to take you as opposed to reasons not to. Getting a "C" on your transcript makes it significantly more difficult for a coach to help you. DO make every attempt to visit each school that you are interested in and to meet with one of the coaches. Meeting with a coach allows you the opportunity to sell yourself. If you are a borderline recruit, it is imperative that you become more than your PR and SAT score. In summary, recruiting within the Ivy League is an intense business. The Ivies are top academic institutions that take their athletics very seriously. Because there are so few admissions spots to go around, Ivy coaches will compete very hard for the same athletes. If you are a top-tier athlete coaches will push you for an early decision commitment. If you are a borderline recruit you will need a plan of attack to obtain one of the precious 250 available spots.